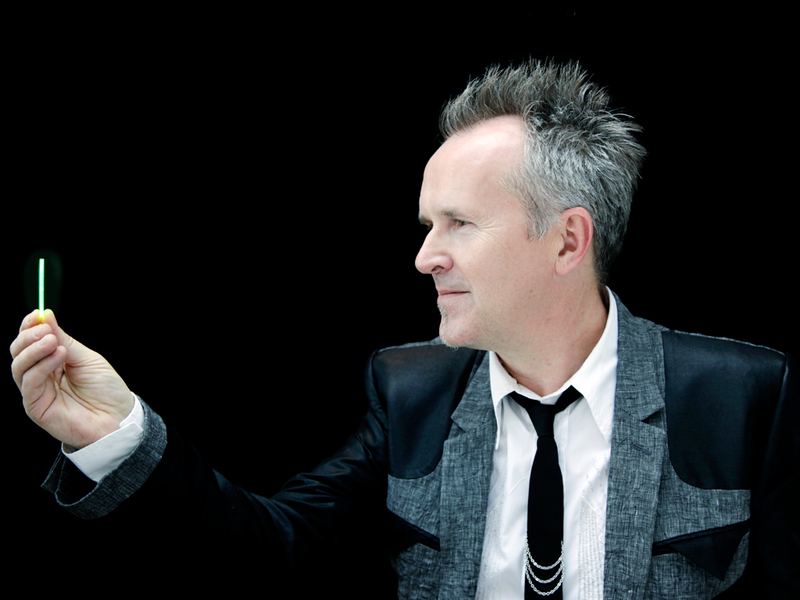 This post started out as a recap of the notable moments from Thursday night’s Howard Jones show at the Keswick Theatre in Glenside, Pa…but evolved into something completely different. So, yeah…I went to see Howard Jones perform this past Thursday night, marking the fourth time I’ve seen him live. The first time was a solo performance of “No One is to Blame” on a digital piano during the June 1986 Amnesty International Conspiracy of Hope Tour finale at Giants Stadium (where he was introduced on stage by Michael J. Fox). I saw HoJo again in June 1989, this time in full electronic mode in Holmdel, N.J. (with the incredible Midge Ure from Ultravox and Visage as the opening act). Then, I had the chance to briefly meet and talk to HoJo after seeing him perform in an “acoustic duo” format (even though he was playing a digital piano) in Blackwood, N.J., in January 2008 (I would have had a picture, too, if my camera batteries hadn’t died). Thursday night, HoJo was in full electronic mode and, for this tour, is playing all the songs from his first two albums, both of which I probably listened to thousands of times as a teenager. The first half of the set included all the songs — although not in track-list order — from HoJo’s 1983 debut, Human’s Lib; the other portion of the show featured all the tracks (again, not in album sequence) from his 1985 follow-up album, Dream Into Action. Personally, what was great about this show was that Howard Jones was the artist who really inspired my teenage love of electronic music and served as the catalyst for my purchasing two pro-grade synthesizers, a sampler, a sequencer and a drum machine by the time I was 17. I felt I had the skills to create songs even though my technical musical ability was — and is — extremely limited. This prevented me from really working with musicians in a traditional band setup so I felt this equipment gave me the means to do everything myself, as well as correct all the flubs due to my craptacular playing ability. Eventually, I found a like-minded spirit (at that time) in the form of my friend Christian Beach, who was my bandmate from around 1988 until late summer 1990. He lived just across town from me and also owned an array of synths, samplers and drum machines. There were two other advantages working with Christian – 1) his gear was better, and 2) he is much more talented and gifted than I could ever hope to be. While many people in the mainstream have this idea that electronic music is easy to execute, the reality is this is not the case. You still have to write the music and lyrics, and play all the backing parts into the sequencer…and this took forever back in the 1980s and early 90s. To prepare for playing live, you needed to do a lot of programming of your instruments and saving those settings into a MIDI file stored on a floppy disk in the sequencer. The song sequences (which include the drum and bass tracks, and any other parts not being played live) were also saved on floppy disks. Since the instrument and song data took up a lot of room on those old floppy disks, we needed several disks…that needed to be loaded (quite slowly, mind you)…in specific order during our shows. As you might expect, this led to some embarrassing moments like having a saxophone coming in as a hi-hat part, or the wrong song sequence popping up, or a footswitch not set up to start a song when it was supposed to be…stuff like that. And Thursday night’s HoJo show reminded me of all the joy and pain electronic music has brought to me over the years. As exciting it is to create all the parts of a song on your own, I remember all too well the difficulties of making the so-called “easy-to-use” technology work for you when you need it to. Two such instances cropped up Thursday night for HoJo. During the Human’s Lib portion of the set, it seemed like the sound assignments for his keyboards on “Don’t Always Look at the Rain” weren’t set up right. That threw the whole song off after a few measures, resulting in a total restart of the song. But that was a minor hiccup compared to what happened during the Dream Into Action half of the show, when “Assault and Battery” — a song I was really looking forward to hearing played live — had to be restarted…TWICE! On the first attempt to play the song, HoJo got through the piano intro only to have the sequence from the previous song kick in (been there, done that…a few times). On attempt No. 2, HoJo completed the piano intro and the right sequence started…and then stopped inexplicably about four measures in. The third time proved to be a charm, however, and the audience was treated to “Assault and Battery” in all its glory. Anyway, I was just happy to see one of my earliest musical influences. Granted, aside from the more recent organ/accordion work I’ve contributed to some of Christian Beach’s live shows and recordings, I haven’t done anything musically significant in my life (although Christian did use lyrics I wrote for a chorus in the song “What Does It Mean to You?” by one of his old bands, Slave of Id, that received some airplay on long-departed 106.3 WHTG-FM around 1993…that was kind of cool). But I still write songs when I can and still do all the parts myself, thanks to Apple’s GarageBand application…and Howard Jones’ influence.